With a combination of long summer days, fantastic food venues and American historical attractions, Sacramento is the capital city of the state of California in the USA. With a population of more than 485,000 residents, the city is a hub of year-round activity. Famous tourist attractions include Capitol Park, Old Sacramento and California State Railway Museum. Cheap flights to Sacramento are now available for a limited period of time, so get ready to explore this fascinating city! Sacramento is home to Sacramento International Airport (SMF), located on a 15-minute drive or 20-minute train ride from the city centre. Do yourself a favour and head down to the neighborhood of Old Sacramento for a trip back into history. Visit five of the city’s top museums and marvel at the antiquated, well-maintained buildings. The Crocker Art Museum offers magnificent views of its Victorian-styled home, with a wondrous selection of permanent art and floating exhibitions. Make your way alongside the American River Bike trail and enjoy the sites of this more than 50km length of beauty that’s suitable for walking and cycling. With lots of hot summer days, cool springs and autumns and moderate winters – Sacramento is a great destination to visit at any time of the year. The city experiences a Mediterranean summer all the way from mid-May through to mid-October so you if you’re looking for some sunshine, you have six months in which to get it. Most of the city’s festivals occur between May and July, including the California State Fair. Winter is very mild and the city very rarely experiences snow, though there is quite a bit of fog in the air during the December to February period. For affordable accommodation and cheap flights to Sacramento, consider visiting between November and March. With six months of sunshine and beautiful walking trails throughout the city, Sacramento is a city that packs plenty of character. There are lots of attractions and great things to do, so make sure you plan on staying for a least a few days. 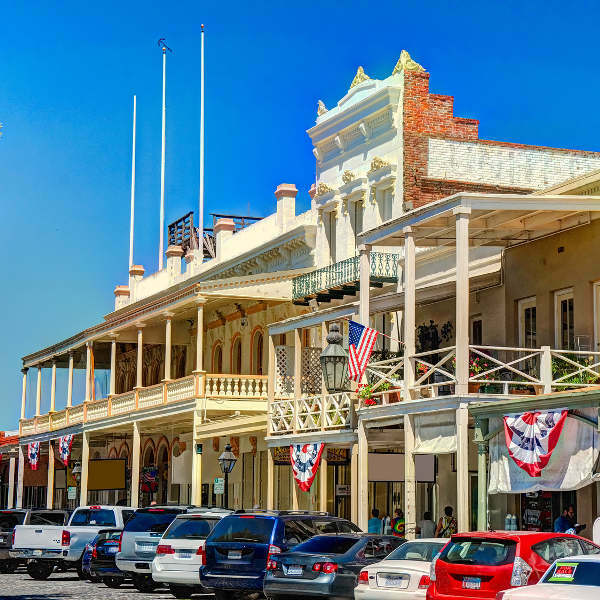 For an appreciation of how things used to be, visit Old Sacramento for a day out. Five of the city’s top museums are found here, including the California State Railway Museum. There are also sweet treats like toffee apples and candy floss available everywhere, and underground tours of the Sacramento River that are not to be missed. Sacramento is also known for its natural beauty, such as that found along the American River Bike Trail. Cycle, skate or walk down the even trail and enjoy magnificent views of lush parks, the river and even some cutesy river otters. To indulge in some culture, make sure to catch Second Saturday. All museums are open to the public and you’ll be able to get into the Crocker Art Museum and see the 15,000 pieces of art on display there. Compare several airlines, and book your cheap flights to Sacramento online at Travelstart! Sacramento is a safe city, though there are some areas that should perhaps be avoided unless you know the area well. Locals are welcoming of visitors and are happy to advise on which restaurants or parks to visit. As with all big cities, it is always important to be aware of your surroundings and to practice caution. Leave your valuables in your accommodation safe and don’t walk around alone in the evenings. Most neighborhoods are safe to visit, including Midtown, Carmichael and East Sacramento.